Industry Experts released the 2017 version of its United States market report on Central Air Conditioning entitled ‘Central Air Conditioning Systems – A US Market Overview’. The new report also discussed the energy efficiency standards and key markets trends of the US CAC market alongside the market estimates and forecasts. Shipments of unitary central air conditioning or direct expansion (DX) central air conditioning systems showed a promising growth during past few years, with a CAGR of nearly 7% during 2012 to 2016 period. Further, this segment is estimated to grow with a projected CAGR of 6.7% between 2017 and 2021, mainly attributed to the anticipated growth in the new residential construction activity and strong growth in demand for replacements. On the other side, shipments of the central plant air conditioning systems have performed poorly and expected to show moderate growth during the analysis period. The slowdown in new non-residential construction is blamed for restricting further market expansion in central plant systems, but demand from commercial office and hospitality verticals is projected to aid central plant systems to achieve a moderate growth. Rapid gains are slated to be witnessed by heat pumps and ductless air conditioning systems. Shipments of heat pumps providing both heating and cooling are set to increase in markets such as non-residential, that give primary significance to energy efficiency gains. Ductless air conditioning systems have taken the industry by storm, growing at double-digit rates in the US for the last five years. Further, manufacturers are raising awareness among consumers about advancements in ductless technology, which make them suitable for any application or climate. The Central Air Conditioning (CAC) systems market report reviews, analyses and projects the shipments of CAC systems in the United States for the period from 2012 through 2022. CAC product segments analyzed in this study include Direct Expansion (DX) Central Air Conditioning Systems and Central Plant/Chilled Water Central Air Conditioning Systems (Central Plant AC Systems) also referred as Applied Systems. 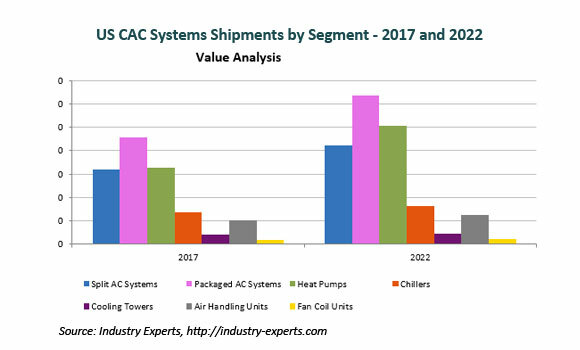 Among the major segments of the US CAC systems, Direct Expansion (DX) Central Air Conditioning Systems are projected to witness the fastest growth of 6.7% in unit shipments and 7.2% in shipments value during 2017 to 2022 analysis period. This growth is mainly attributed to the significant growth expected in the residential construction. Shipments of Heat Pumps are estimated to spur the growth of DX systems, registering a 2017-2022 CAGR of 8.9% to reach 3.8 million units valued at US$5 billion in 2022. The report also analyzes the shipments analysis of the sub-segments of DX CAC Systems – Split AC Systems (only greater than 8 kW of cooling capacity are considered for this segment which are capable of accommodating more than one indoor units and to be considered as central systems), Packaged AC Systems and Heat Pumps; and Central Plant CAC Systems – Chillers, Cooling Towers, Air Handling Units and Fan Coil Units. This 162 page market report includes 32 charts (includes a data table and graphical representation for each chart), supported with meaningful and easy to understand graphical presentation, of shipments. The statistical tables represent the data for the CAC systems shipments value (in USD Million) and in unit shipments for major product segments and their sub-segments. The study profiles 8 major market players and 46 other key players that are engaged in central air conditioning systems production and supply in the US. The research also provides the listing of the companies engaged in the production of central air conditioning systems and equipment in the US. The list of companies covers the address, contact details and the website addresses of 78 companies.